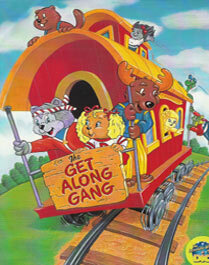 The Get Along Gang is a group of kids who have an abandoned red caboose for a clubhouse. 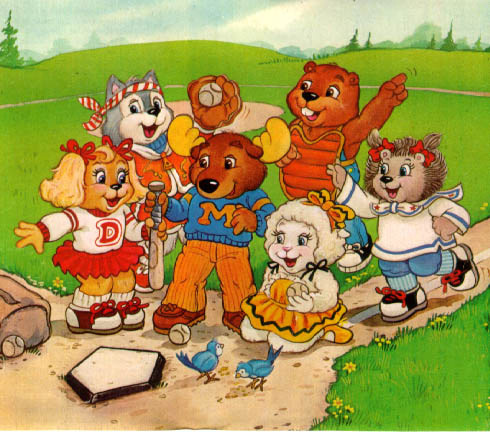 The group consists of Montgomery Moose (their optimistic leader), Dottie the dog, Woolma Lamb (a self-indulgent, cute sheep), Zipper the supercool cat, Bingo Beaver (the practical joker), and smallest of the group isPorsha Porcupine. They lend a helping hand to those in need, foil the plans of Catchum and Leeland, then get a sundae at Mr. Hoofnagles' ice cream parlor. 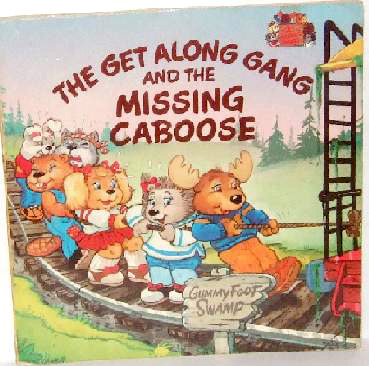 The series was based on popular childrens books. Montgomery "Good News" Moose, the leader of the Get Along Gang who was sometimes awkward. Well-rounded, he excelled in athletics while tinkering in electronics and science. Dotty Dog, a cheerleader and sort of "second-in-command." Woolma Lamb, an aspiring ballet dancer who seemed to be defined by her vanity. She was often seen carrying a mirror to primp, or admire herself. Zipper Cat, an athletic feline who was always playing the tough guy, despite being friendly to the rest of the gang. Portia Porcupine, the youngest member of the Gang who was always inquisitive. She tended to cry or throw tantrums when frustrated. Bingo "Bet-It-All" Beaver, a prankster and gambler who sometimes acted as comic relief. He had a fear of water until he saved a dam from giving way. Braker Turtle, who was ironically the fastest runner in Green Meadow. He enjoyed being hip, despite his nerdy appearance. Rocco Rabbit, a reformed bully who was almost always asleep. He and Braker may have been inspired by the Tortoise and the Hare. Flora "Forget-Me-Not" Fox, an avid botanist and photographer who was extroverted despite appearing shy to others. Bernice Bear, a tomboy who liked to keep things neat and tidy. Bernice was also proficient in cooking and sewing. Lolly Squirrel, whose father owned a candy factory. She tended to be a bit of a tattletale at times. Hocus Hare and Pocus Possum, a pair of magicians. Catchum Crocodile, a constant troublemaker who was always trying to take whatever he wanted, regardless of whose it was. 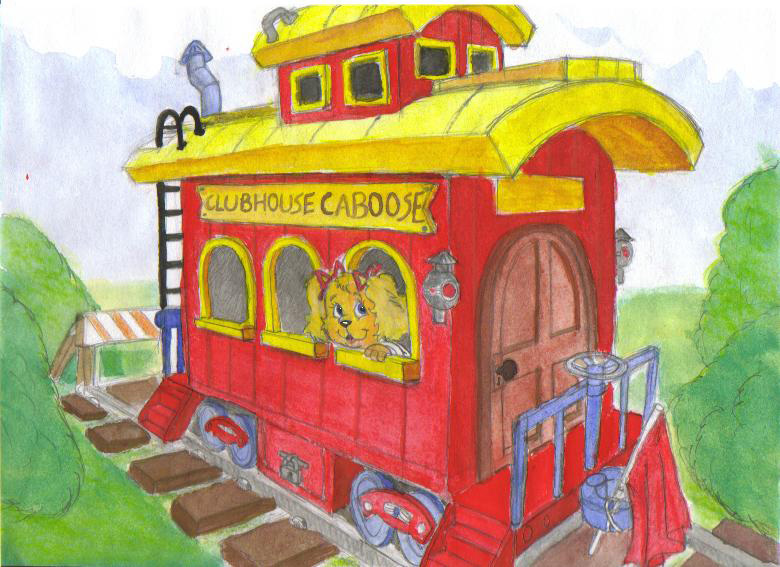 More than once he tried to steal the Gang's "clubhouse caboose." Leland Lizard, Catchum's dopey sidekick, who was sometimes not as dumb as he looked. In the pilot he was able to change color, but he showed no such ability in the series. Officer Growler, a bulldog police officer. Mr. Hoofnagel, an old goat who owned and operated the local ice cream parlor. Miss Deering, a deer who was the kids' teacher. Mayor Bascombe Badger, the mayor of Green Meadow. Schneider Squirrel, Lolly's father and owner of the candy factory. Schneider appeared only in the Marvel comic book version. Montgomery is the leader and he's such a good sport!